Content warning: if you're feeling fragile, don't click on the links. Seriously. 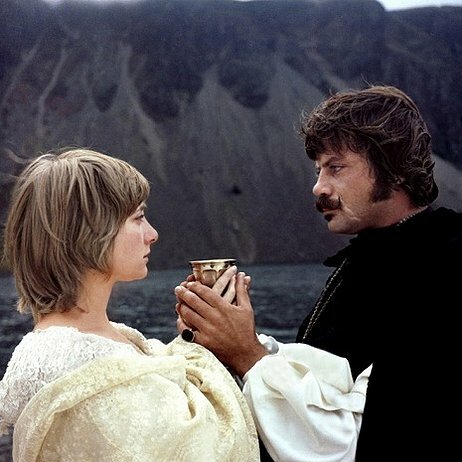 Last week, the film critic Mark Kermode posted a short piece recommending, and celebrating the brief screening of, the Ken Russell film The Devils. Released in 1971 and surrounded by a maelstrom of controversy ever since, The Devils remains unavailable on DVD and very hard to see. The new screening is, apparently, only the second time it's been shown uncut. I first saw The Devils, or part of it, in my teens, as part of a banned films season on Channel Four; later, another banned films season allowed me to see it all the way through in my twenties. I say 'allowed', but I didn't entirely take advantage of the opportunity. I have it on VHS somewhere around the house, but I never watched the ending all the way through. I couldn't. I saw some of it in my teens, and I still haven't recovered. I don't think you're supposed to. The plot, for those new to the film, is this: in seventeenth-century France, a priest named Grandier opposes the machinations of Cardinal Richelieu and King Louis XIII in defence of his town of Loudun. Grandier is a noted philanderer and sinner, the subject of fevered imaginings from the abbess of the local convent, a place of repression and frustration where fantasies of the body of Christ have taken on a masochistic sensuality. Seeing the advantage in manipulating these nuns, Grandier's enemies stage 'exorcisms' in which the nuns, in a burst of pent-up sexuality and self-protection (threatened as they are with death if they don't comply) stage grotesque and blasphemous contortions to accuse Grandier of possessing them. Grandier refuses to confess and speaks out against the corruption; for this, he is arrested, tortured - and oh my goodness, he is tortured - and burned at the stake, screaming of the destruction of freedom as his face bubbles and blisters in the flames. It is, in short, an extreme film. It makes The Passion of the Christ look tame. That kind of comparison is often used by critics; it's an easy way to make a point, and sometimes a cheap one. But I use the comparison advisedly, because if one compares the two films, it showcases The Devils in an interesting way. Both are films of martyrdom and torture. Both can be read as serious religious reflections or as wanton orgies of grotesquerie. Both inspire passionate responses, some positive, some negative. Yet one is hugely successful and considered practically a religious text; the other is best described by that flexible label, 'controversial' - and practically unfindable. And I think it's the tameness - not just in the sense of moderation, but in the sense of control, domestication, safety - that makes the difference. The message of The Passion of the Christ is very simple: 'Christ died for your sins.' The controversy around it arises from other apparent messages, such as 'And it was largely the fault of the Jews.' Given the way Mel Gibson talks when drunk, it's not unreasonable to conclude that The Passion of the Christ did indeed blame the Jews, though I would argue that the film's antagonism is not confined to the Jews: it shows a clear line of distinction between those who follow Christ and those who don't, and those who don't are all evil or grotesque one way or another. It's prejudiced against Jews in particular, but it's prejudiced against any non-Christian; Jews are just the ultimate non-Christians in its cosmology. The Devils is more complex in its message; it has no clear opinion as to metaphysics, but shows a desperate interest in how religion can be intertwined and corrupted by politics, sexual repression and personal advantage. It doesn't necessarily declare religion itself bad, but it's about bad expressions of religion; if you don't like hearing religion criticised, that's going to be uncomfortable. When it comes to violence, though, I think there are two main reasons why The Passion of the Christ is safer. The first is simply an issue of realism. Christ, as played by Jim Caviezel, is hit with a variety of nasty objects and sheds copious blood, but the performance itself is moderate. Caviezel blinks, flinches, gasps and groans, but his expressions of pain are fairly limited. Grandier, as played by Oliver Reed, has his tongue stabbed, his legs crushed ... and he screams. He howls, wails, cries out in utterly convincing agony - and it's convincing because it's undignified. There's nothing decorous about it: it's just horrific. Surrounded by a capering crowd and half-drowned by wild, clanging music - you can see a bit of it here, if you like, though be warned it's deeply upsetting - the death of Grandier is profoundly physical in a way that the death of Gibson's Christ, for all its special effects, is not. The other is at least as important, and explains a lot about why one film is so much more disturbing than the other. The Passion of the Christ is a curiously vindictive film: for all its supposed realism, it adds punishments to sinners not featured in the Bible: a gang of deformed children pursuing Judas, a crow pecking the eyes of the thief who mocked Christ. Sinful behaviour is punished swiftly and cruelly; meanwhile, the Devil stalks through the crowd, watching, only to scream in defeat at the end. God and the Devil are both, we can therefore assume, keeping an eye on things. Events may be unpleasant, but they aren't unsupervised. Christians may already know that things will work out okay in the end, that being a notable element of Christian theology, but Gibson is at pains (or rather, inflicts pains on his characters) to remind viewers of this every so often, just in case they forget. This isn't a thriller, and suspense is out of the question: the audience is not to suffer the despair and doubt we can assume the Virgin and disciples felt. Christ doesn't scream, and God isn't a hands-off manager. It may look messy, but everything's under control. Grandier's death is protracted, and it's also chaotic. Surrounded by his torturers, then crawling on broken legs through a Bacchanalian crowd, he is absolutely going to die, and between now and his death there's going to be nothing but hideous pain and merciless revilement. The revelling crowd and lonely death are clearly Christ-like in their overtones, but Grandier will not rise. Perhaps he'll go to heaven, perhaps there is no God: the film doesn't make it clear. In this world, he is doomed: irrevocably, viciously, hopelessly doomed. There is nothing to console him, and therefore, nothing to console us. The Passion of the Christ, in short, is heavy-handed in its insistence that God is never out of control, and as a result, for all its gore it cushions the audience in a way that The Devils doesn't. Unsympathetic reviewers complain that The Passion of the Christ actually becomes dull after a while, and I think the heavy-handedness is the reason: by keeping such an invasive control over the story, Gibson actually removes tension and limits the viewer's involvement. Doubt is forbidden, and without it, emotions are constrained. The Devils, on the other hand, gives us the option - the sin - of genuine despair. While it's actually a film that roundly condemns blasphemy and honours true faith, it doesn't just depict sin: it offers the viewer the chance to feel it as well. It's prepared to be that dangerous. Watching The Passion of the Christ, I was surprised at the main emotion it provoked in me. Perhaps it's not my place, but what I mostly felt was towards Mel Gibson, and what I mostly felt was spiritual pity. In a film that made a great issue of its authenticity and tried to preach faith, it seemed he'd been unable to contain and separate his own failings, or at least the failings you might infer from his other films: love of violence for its own sake, love of vengeance, fear of doubt. It struck me as an object lesson in how easy it is to let your beliefs become a vehicle for your vices, and hence in a roundabout way did actually fill me with the desire to become a better person, not because of Christ's sacrifice but because I saw how easy it was to become self-justifying. The Devils is not so easy a film to distance oneself from. There are moral criticisms you can make of it: its gender portrayals tend to cast women as flesh and men as mind, and being a film of staggering extremes, the capering mindlessness of the nuns and the anguished physicality of the abbess (an exceptionally intense performance from Vanessa Redgrave) are graphic indeed. It tends to play to stereotypes of camp versus traditional masculinity, a subject I've discussed before. I would not say that it's a film that aims to denigrate, but it's the film of a white, heterosexual man of his time that has very few scruples about how it shocks. And my goodness, it shocks. 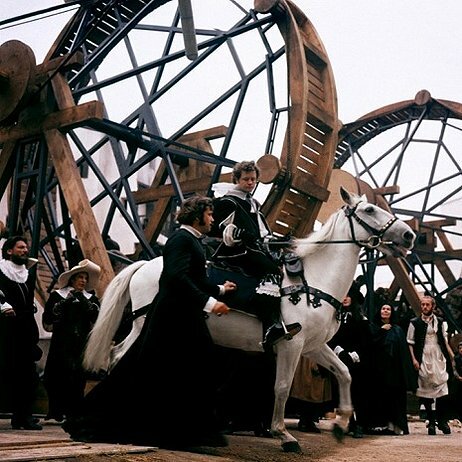 The artistic direction of the film is extraordinary: Derek Jarman's visual designs, created, said Russell, to show how the citizens of Loudun, like people everywhere, considered themselves modern, are stark, stylised, geometric and elegant in their bleakness, while Peter Maxwell Davis's music, described by a critic I can't recall the name of as sounding as if it's played in a public toilet, echoes with wheeling, harsh surrealism throughout. Speaking just as an individual viewer, it's a film I've loved, a film I've hated, a film I've admired and a film I've been very angry with - but it's a film I've never, ever forgotten. The fact that it's been unavailable so long, in short, is ridiculous; it's not a nice film at all, but in its way it's a horrible masterpiece. Listening to Mark Kermode speak of it, though, another defence of it occurs to me. Kermode is well known for defending The Exorcist as the best film of all time - a view that, while I enjoy Kermode's reviews and don't question his right to have personal favourites, I find hard to swallow, not just because while The Exorcist is a perfectly good horror movie I wouldn't call it all that incredible, but because it's a darkly dishonest view of exorcism itself, and a pernicious one at that. I've talked about this previously, but there's a problem with films about demonic possession. People still 'exorcise' people, often children ... which means, in extreme situations, that mentally ill children are abused by priests who consider themselves heroes. It's a horrendous situation, and one that too many films treat as an opportunity for thrills and spills, validating the abuse and portraying the mistreatment of children as noble. Films about possession and exorcism tend to go in that direction, in fact, because it's difficult to be shocking if you don't. The German film Requiem is a tasteful portrayal of the life of Annaliese Michel, a girl who died of too many 'exorcisms', but as its title suggests, it's not going for your throat, but plucking gently at your heart. Russell, on the other hand, absolutely goes for your throat. He portrays horror, and far more horrifically than The Exorcist or its imitators. Unusually, though, he does not confirm the possession. Like Arthur Miller in The Crucible, he uses an historical 'possession' to inveigh against malevolent authority; like Miller, Russell is clear that the horror was not the demons but the demonologists. As such, The Devils - while definitely an arthouse film rather than a mass-market horror movie - is an important counterweight to all the cinematic falsehoods out there that present spiritual abuse as a grand struggle against evil. If you get a chance to see The Devils - but no, I can't recommend it unreservedly. Don't see it if you have any traumas to trigger. But if you're feeling robust, it's a truly unusual and remarkable film, a cinematic assault you'll undoubtedly be more experienced, if not necessarily happier, for seeing. I can't believe I've never heard of this movie. Of course, given how hard it apparently is to find, maybe I shouldn't be surprised. But you draw some great points from it. I especially appreciate your discussion of the way Hollywood portrays exorcism. I may try to track down "The Devils," but I'm not sure when I'd find myself in the mood to subject myself to all that. I watched parts of a few clips, and just couldn't continue. I can't bring myself to watch The Passion of the Christ, either, though for different reasons - at the time it was released, one of my professors was deeply involved in condemnation of the film, and I just haven't much interest in watching it, even as one of those films I should probably watch because it's famous/talked about. The post was a fascinating read, though. It's interesting how much I like reading about movies I haven't seen. I'd say it's one of those famous films that you can actually get a fairly complete sense of by watching the trailer. (300 also comes to mind.) It's primarily a style piece, and once you've seen the trailer you've got a sense of what the style is, and you can pretty much intuit the rest ... as long as you mentally multiply the violent bits by a large factor. I'd be interested to hear about your professor's involvement if you were willing? Sure! He was a rabbi, and grew up pre-Vatican II. The Catholic church in his neighborhood used to give a sermon on how the Jews killed Christ every Easter, so the Catholic kids usually left service and went looking for Jewish kids to beat up on. I have the sense that Jewish adults may have also stayed off the streets, but I'm not sure I have any basis for it. A lot of his criticism of the Passion of the Christ was in that light; he found it chock full of anti-Semitism, and feared that it would arouse many of the old attitudes and prejudices towards Jews. He worked closely with local Muslim groups who had similar concerns (for both Jews and Muslims). Unfortunately, I wasn't able to attend the parts of the conference that focused on Muslim concerns. I know he also had grave issues with the uncomplicated linking of religion and violence, especially in light of the war rhetoric in the US, and how there was increasing talk of "crusades" into Iraq. He was nationally active in encouraging discussion of the issues and discouraging churches from just showing the film to congregations, especially to youth groups, without dialogue about racial and religious issues; he was very concerned it would become a cornerstone in Christian culture, especially parts of the culture that didn't regularly participate in many other movies/books. I wish I could do justice to his grounding of his criticism in the Torah and Jewish thought; it was deeply compelling and, in many ways, life changing, but many of the details are lost to memory. It was deeply compelling, though, and one of the first times since I'd lost my own faith that I felt like religion was a source of strength against oppression. How very interesting; thanks for sharing that. Your rabbi sounds very impressive! And yeah, I can certainly see where he was coming from on the religion-violence link. Especially since Gibson's God was every bit as violent as the supposedly evil characters. For hateful toads like Gibson, it's not about who's more compassionate or helpful, it's just about whose god can kick all the other gods' asses. Wow, this brings back some memories. Looking back now, I'm not entirely certain what his motive was, though I have a suspicion it was a genuine, albeit misguided, attempt to highlight different viewpoints regarding the Christian faith in the media and perhaps even some of the abuses committed in the name of Christianity and the allegories thereof. Whatever his reasons, looking at the links again, I'm surprised at how much of a risk it was to show us any of these films at all, especially considering that maybe three of the films in question were effectively "banned" at the time. In short: thank you for this incredibly thoughtful post concerning a film I remember, if not with affection, then perhaps with a certain nonplussed wonder. I'm also reminded of The Last Temptation of Christ, another film that's never quite left me. It's troubling and it gets under you skin, and it's meant to. I can see why folks got outraged. Because it had the honesty to suggest that had you been there in those days you wouldn't be a painted cardboard Bible Story character nodding "Ah yes, truly he is the Son of God." Instead you'd be an actual person, baffled and worried that your friend, your brother, your lover was talking of the Kingdom of God and declaring himself Messiah. It's a thoughtful, aching meditation on faith. Another one I have to be in the mood to watch, but one that always leaves me to something to ponder over. I was able to find The Devils on VHS a few years ago, having glimpsed the trailer on BBC at a friend's place, sometime in Spring of '86. It was at least a decade later when I finally saw it. It has stuck with me. Thanks for your thoughtful observations. Re Gibson: has anybody ever sussed out his aversion to Greek/the Greeks? That was one weird little detail in the Passion.